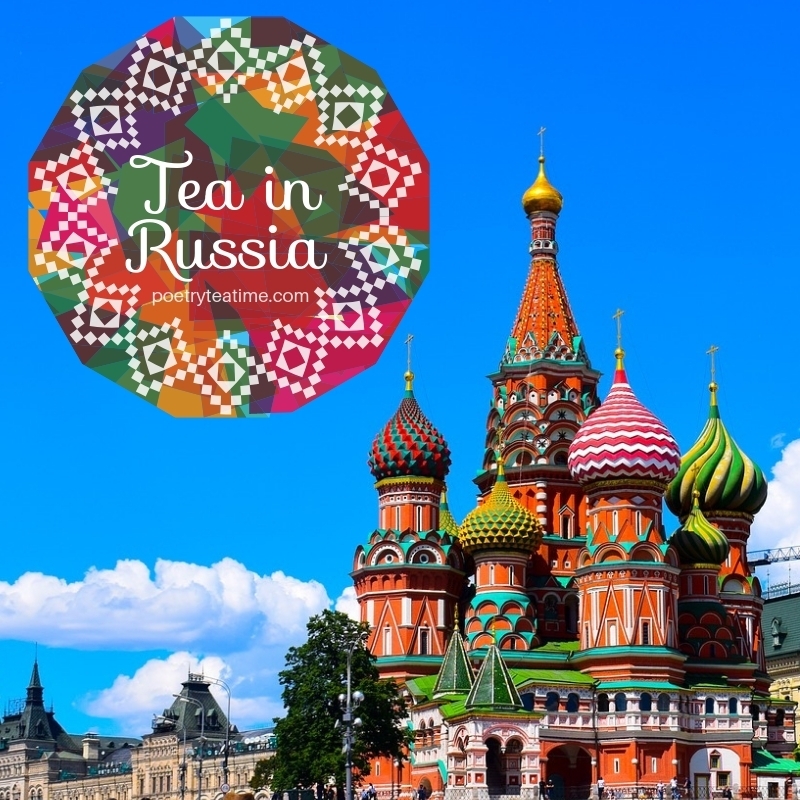 Did you know that tea is considered the unofficial national drink of Russia? While movies and TV shows usually show Russians drinking bottles of vodka, tea is actually drunk more often all over the country both as a social custom and to combat cold and darkness of the long winter months. Tea has been a popular drink in Russia since the days when horse and wagon caravans would take tea from China and Mongolia to Russia. Because of the dangers of caravan travel, tea was too expensive for anyone but royalty to drink. However, with the rise of railroads and packaged tea concentrate in the 19th and early 20th centuries, tea became more affordable and its popularity spread until it reached almost every household in Russia. Tea is prepared in a distinctive way in Russia. First, zavarka (a strong tea concentrate) is mixed with boiling water in a small teapot. The teapot is then placed on top of a samovar, a metal heating device that keeps water hot all day (see the pictures below). Each person pours themselves a little tea concentrate from the small teapot and adds hot water from the samovar until their tea is as strong as they want it to be. They can also add honey, sugar, or jam to sweeten the tea. Each family has their own samovar, often several generations old and decorated with elaborate designs in different types of metal. While the samovar doesn’t have to have a smaller teapot on top, most do to help serve tea more easily. Many families also have matching cups called podstakannik that are decorated with designs in metal and glass. 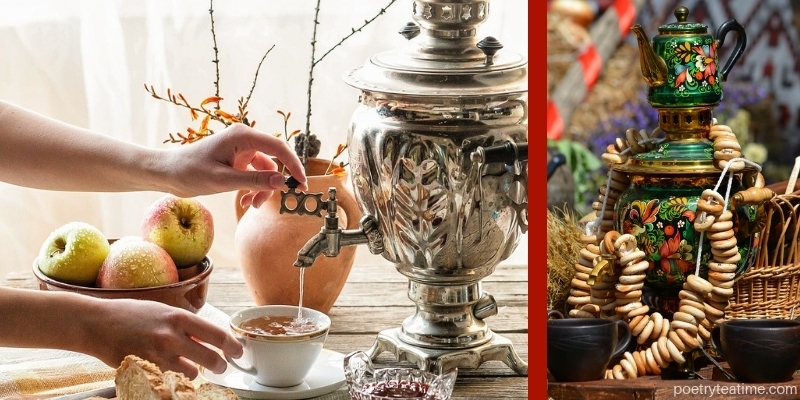 The samovar originated in Russia but can be found today in areas as far apart as Vietnam, Iran, and Turkey. No Russian tea is complete without some treats on the side. Typical snacks eaten with tea include sliced meat, cheese, and sushki, a ring-shaped hard cookie that’s dipped in tea before eating. Having tea in a Russian home can last several hours, with lots of time for conversations as well as eating and drinking. There is a version of tea popular in the US, especially in the South, called “Russian Tea.” This type of tea usually combines instant tea powder with orange juice and spices. 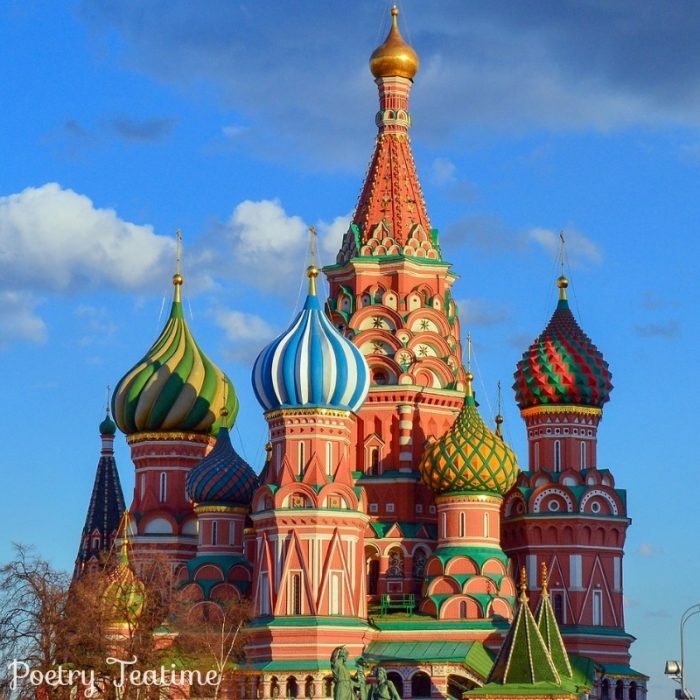 While it’s been popular in the US for over a century, it actually has no connection to Russia! Why not try making some real Russian tea at your next teatime? Make tea: You can use any variety of loose-leaf tea that you like, whether black or herbal, although Russian Caravan tea is especially good. Green and white teas sometimes taste bitter if steeped for a long time, so you may want to avoid those. Heat up a teapot by pouring boiling water into it and then pouring the water out again. Once your teapot is hot, add about three tablespoons of tea to the pot without water and close the lid. Let the leaves steam for a few seconds to prepare them. Then, pour in enough boiling water to cover the leaves with a bit of extra water on top and let steep for fifteen minutes. Add some jam or honey if you’d like it to be sweet. This will create your tea concentrate or zavarka. You’ll need a second teapot with boiling water. In individual cups, mix a bit of the zavarka with boiling water and add more jam or honey if needed. The pot of zavarka can last for multiple hours if you keep adding water to it whenever it runs low! Find more guidelines for tea preparation at this link from Tea Culture. Sushki: Your Russian tea won’t be complete without this iconic ring-shaped cookie. The recipe is actually pretty easy to make and only requires common baking ingredients. Find out how to make it here at Olga’s Flavor Factory.